LE MANS, France -- When my sister was in junior and senior high school she had to suffer though a number of "new" math programs that tended to warp those young minds who were just trying to get through the day. This year at the 24 hours of Le Mans we will see another form of new math -- "Le Mans math" -- that has been designed by the prestigous ACO, the French rulers of the sport in order to have a more competitive race. The first and perhaps most important for new math is that the ACO restricted the displacement of diesel yet again, taking the displacement of the diesels to 3.7 litres -- a paltry 225 cubic inches -- in an effort to slow these current titans of the Circuit de La Sarthe. The ACO also indicated that in an effort to give the petrol cars a better chance against the diesels that they would monitor performance in the early races of the season and make adjustments if needed, in order to narrow the margin of performance between the diesels and the petrol cars for its crown jewel -- the 24 Hours of Le Mans. After the early season races were complete that ACO made its decision (around May 20th) to "adjust the performance" of cars in order to equalize the on-track competition. It tried to do this without putting a penalty on the diesel teams, who truth to tell have spent a king's ranson in developing their diesel rockets. Attempting to rule with the wisdom of Solomon, the ACO did virtually nothing to penalize the diesel technology per se. Instead they forced the diesels to stay in the pits longer on their fueling stops by reducing the size of the refueling nozzle and increasing the size of the feuling hose for the petrol cars. In addition they gave the petrol an increased amount of air an The results are still out as we really won't know how effective the new rules are until Sunday at 3 pm, but suffice to say the diesels continued to dominate at this most famous race track and based on qualifying the ACO equation may need another tweak as the diesels of Audi and Peugeot dominated, taking the first seven spots on the grid with the closest petrol competitor Rebellion Racing's Toyota-powere Lola chassis, more than seven seconds off the pace. The old addage that "cubic dollars always beats cubic horsepower" seems to be in play here and this is an area where the ACO has little control over the sport unless it turns the 24 Hours of Le Mans into a $250,000 claiming race -- and the repercussions from such a move would likely eliminate any manufacturer ever getting involved in the again. Of course when it comes to math, both the Peugeot and Audi teams have been very busy over the last year building engines to meet the specs and while they both have the same formula and specifications -- they each came out with different engines -- which at the very least will make for forum fodder on many internet sites. The Peugeot Team has choosen to stay with its "V" configuration of the last five years -- a 90 degree V-8 which uses many of the same design elements as previous Peugeots that have been very successful, particularly over the 18 months. After its win in 2009, the Peugeot seem to have Audi's number, winning just about everything in sight with the exception of the "Golden Ring" -- the 24 hours of Le Mans in 2010. A part of the issue belongs with Audi team which has shown the speed to stay with the Peugeots but has not been able to race " a clean race". It seems that there have been issues in nearly every event for the Audi team, whether they are of their own making or of someone esles. For example at Sebring this year one car had a tire puncture that took it ouf of competition early on, while another was run into early in the race by one of the Peugeots ostensibly taking them out of the race . From a pure speed perspective it appears that the new engine and chassis is more than a match for the Peugeots. But with the cars evenly matched it means that the team that runs the cleanest race, the fewest mistakes will take home the trophy and thus far that honor has rested with the Peugeot team. However, Audi has breathed new life into its car with its new engine -- a 120 degree V-6, designed specifically to fit the new chassis. Still, it doesn't appear that the rest of the field has worked as hard nor spent as much money on development as either Peugeot or Audi and therein is at least a part of the problem. Both Audi and Peugeot see the development of the turbo-charged injected engines as driving thir future sales and as such are investing in both the marketing of its brand through racing (recall another old but true addage: " What wins on Sunday, sells on Monday") and research and development. Indeed the vaunted Aston Martin brand, which in the past five years has been more than competitive in the GT1 class, has not been able to keep up with the diesels, and while the team has been in catch-up mode all season, the results have been equally in catch-up mode with the team's best efforts putting them 20 seconds off the pace of the leaders in qualifying. Even with the diesel teams giving up 15-20 seconds in fueling stops (due to the smaller hose) it does not seem as if it is in the cards for a petrol car to make the podium. 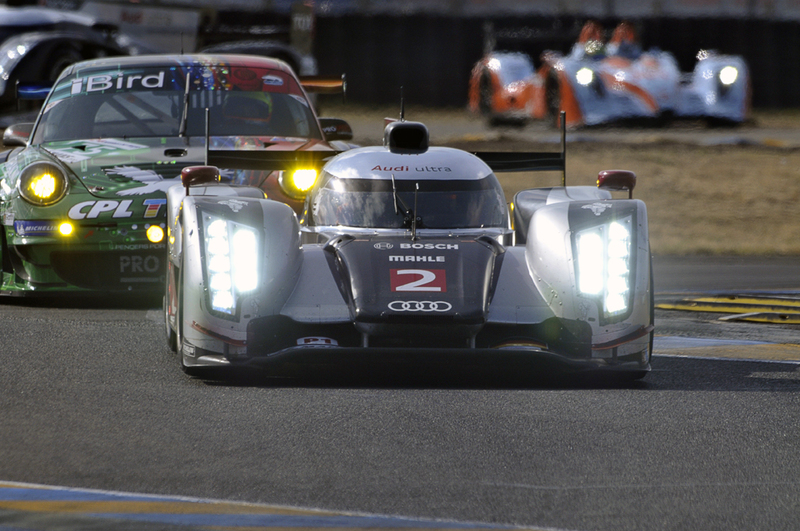 However you add up the numbers, the new math of Le Mans will ultimately play out on the tarmac of thge Circuit de la Sarthe -- with the smart math betting on the diesels. Thanks for this insite on the rules governing the race, it’s a great back story that you’d only be aware of if you were talking to the teams in the pits. Most media just covers the race results. Amazing that the ACO is “adjusting performance” of the cars DURING the race.